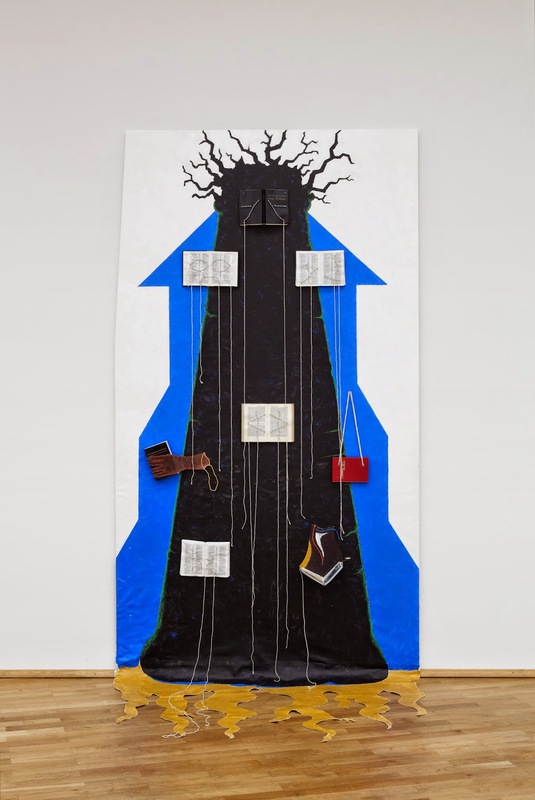 Zambia’s Lawrence Chikwa is among a group of African artists currently showing in a high profile exhibition entitled The Divine Comedy (Heaven, Hell, and Purgatory Revisited by Contemporary African Artists in the Museum für Moderne Kunst – MMK (Museum of Modern Art) in Frankfurt, Germany. His work entitled Possibility to Create in Hell features alongside the work of some of the biggest names in contemporary African art on the global scene. Coming from twenty African countries the artists are taking a look at Divine Comedy the classic from western literature written between 1307 and 1321 by the Italian poet Dante and twenty-three of the works including Chikwa’s were produced explicitly for this occasion. “Taking their own widely differing cultural and religious backgrounds as a starting point, the artists investigate individual thematic sequences of the Divine Comedy,” states the press release from MMK who planned the event in collaboration with international curator Simon Njami. “In his epic poem, Dante reflected on theological, philosophical and moral matters that still bear relevance for the issues facing society, politics and the economy today, but also questions of faith. The exhibition proceeds on the premise that Dante’s visions are applicable to many cultures and many religions,” continues the release. And although it only went on display in March The Lusaka-based artist’s work was completed in 2009 and the preparations for the show took six years. Chikwa explains the opportunity came through a gallery he is affiliated to in Switzerland, a connection he made while studying at the Ecole d’ Art d Valais in Sierre, from where he graduated with a BA Fine Art in 2006. The work is an allegory, just like Dante in the poem travels through Hell, Purgatory, and Heaven; Chikwa’s Possibility to Create in Hell has a dual narrative. Certainly it references the notion of hell, but it arouses the imagination to ponder the possibility of being able, as a soul to create anything in that realm. It also suggests the African situation as a hellish atmosphere wrought with war, disease and poverty and alludes to the miraculous ability by which an artist is able to produce anything under these conditions. “I’m looking at it in an African context where many things seem impossible and where empowerment of creativity is in short supply not just because of wars and poverty,” explains Chikwa. Of course those are the artist’s own words,but perhaps it can also be read this way, the African condition is Chikwa’s hell, the Frankfurt exhibition is his purgatory from where he awaits artistic judgement and depending on the success of the exhibition he will ascend to an artistic heaven abound with opportunities on the lucrative international circuit. 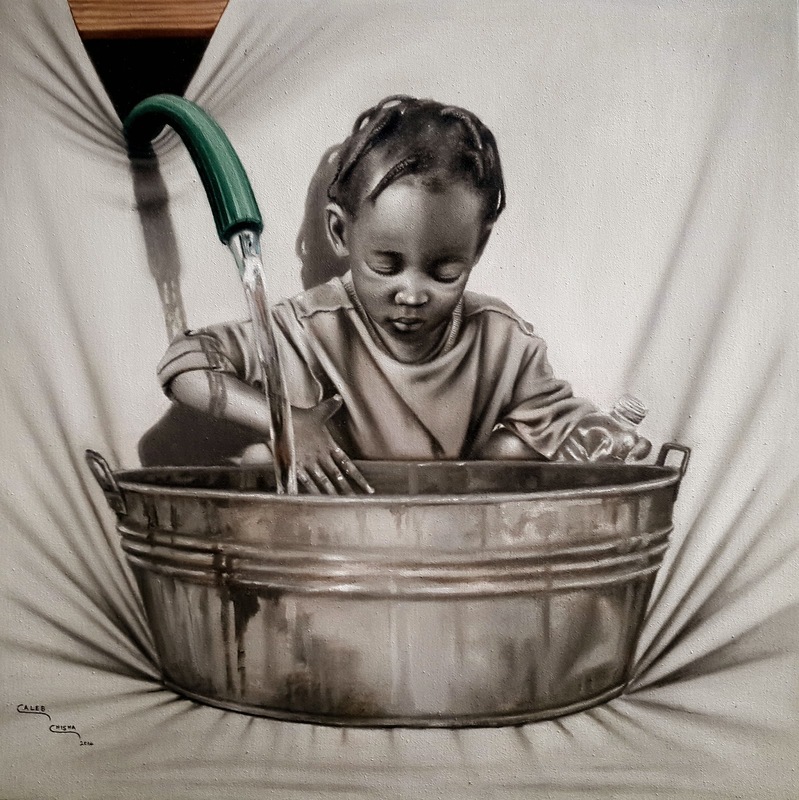 As can be expected of Chikwa, the work is complex; he is a conceptual artist through and through so one must not expect seeing a pretty painting hanging on the wall. It is a puzzling combination of mixed media set on a large canvas that flows down to the floor. The main visual is the painted silhouette of a black baobab tree that starts from the top of the canvas ending in strips of flame-like tassels. The baobab – a symbol of life, wisdom or knowledge in several African customs -- is riddled with actual Bibles and other religious books in various languages including Italian and French; these are sewn into the large canvas and have strings loosely hanging from them. There is no telling what they reference; the same applies to the deep blue house-like outline behind the baobab. Unapologetic, idea-driven works like this are often choked by the complexities of metaphor and couched in exasperatingly complex theory, it is often aimed at challenging perceptions and accepted belief systems which does not seem to sit well with the Zambian viewer, as can be noted from Chikwa’s past exhibitions such as Translations (The Endless Way) - 2008 and The Challenge to Create in A classified world today - 2011, held in Lusaka, which received mixed reactions the sharpest coming from fellow artists. The 40 year-old belongs to the third wave of European schooled Zambian artists most of whom studied in Scandinavia and Switzerland at the dawn of the new millennium where they adopted or at least intensified their affinity for new media and conceptual art unlike their England trained forerunners who embraced the more conservative methods of painting and sculpture a decade earlier. His type of radical creative expression, however, has become the preference for international curators such as Njami and their western clients like the MMK, it is the type that will get you in to the blue-chip Biennale, art fair or exhibition. Nevertheless, also quoted in the MMK release is the museum’s director Susanne Gaensheimer who hints that the exhibition was an opportunity for the institution to provide a platform for the African artists. “In recent years the hitherto Western-dominated contemporary art discourse has come increasingly under the influence of non-European protagonists, theorists, artists and curators. In our society—defined as it is by globalization, migration and the crossing of cultural boundaries—it is of great importance for us to contribute to shaping these developments with exhibitions such as ‘The Divine Comedy’”, states Gaensheimer. The MMK also suggests the exhibition: “aims to inquire into the significance of African artists’ work not primarily in the post-colonial context, but above all with regard to their aesthetics”. However, one may be forgiven to observe that the international curators hired by instituions such as MMK are a very small group who rarely select anyone outside their line of vision, a line of vision that has been blurred when it comes to focusing on Zambia so this is a coup for Chikwa and an indication that he may be included in future shows of this nature seeing he has now caught the discerning eye of an international curator, which is not easy. Carol Becker, Dean of Faculty at Columbia University School of the Arts gives mention of these international curators in the Art Journal during their rise to prominence in 1999, she points out: “Some who move through such an elite world of art, culture, writing, production and exhibition now seem to answer only to the art world. Even though the work seems to be social motivated, the only real consequence of such critical effort is the degree to which the work is found acceptable, unacceptable or exceptional by the art world, measured by reviews it receives – the quality of the paper trail it generates and relatedly the sales it ultimately accomplishes”. As for these curators being “non-European “as the MMK director alludes, maybe so, but those of so-called African decent are as pretty much as African as Picasso. It can be argued that the West only selects them as exotic colourants and flavourings to their contemporary art casserole, and in the West’s collective mind the artists this pantheon chooses are probably as exotic as the gatekeepers themselves. Interestingly, similar to the MMK show but in a totally unconnected exhibition entitled “Here Africa / Ici l’Afrique - Contemporary Africa through the eyes of its artists” currently running at Château de Penthes in Geneva, a show that “assembles, for the first time in Switzerland, contemporary African art with more than 70 works by 24 artists from 17 African countries” the participating artists were selected “…for their great contribution to the aesthetic and cultural development of their continent, as well as for their involvement in key questions regarding African people.” This show is put together by international curator Adelina von Fürstenberg-Herdringen, an Istanbul-born Swiss of Armenian ethnicity. This parallel exhibition reaffirms that Africa is really a hot topic in Europe. But despite Africa’s deep artistic pool, the same names – mainly of artists who do not even live on the continent -- often surface in these western funded global African exhibitions. For instance the celebrated artists Zineb Sedira sometimes listed as either French or Algerian and Yinka Shonibare (Member of the Order of the British Empire) sometimes listed as British or Nigerian are featured in both the German and the Swiss exhibitions mentioned here as is the new darling of the global contemporary African art scene Edson Chagas of Angola who was inducted into the power circle after his country was awarded the coveted Golden Lion Award for the best pavilion at the Venice Biennale last year. Speaking of which, it was the leading German art magazine ART in an article by the senior editor Ute Thun entitled "ANGOLA! WO IST ANGOLA?" (translated ANGOLA! WHERE IS ANGOLA?") that outwardly made fun of Sub-Saharan Africa’s first recipient of the accolade. Nonetheless, as much as Zambians can celebrate having one son of the soil in the ongoing Frankfurt exhibition, it should be noted that the South Africans were afforded a more generous number, featuring all their – already international – big guns namely Jane Alexander, Wim Botha, Frances Goodman, Nicholas Hlobo, Nandipha Mntambo, Guy Tillim, Andrew Tshabangu, Minnette Vári and Kendell Geers who also apears in the Swiss show. Again it would not be wrong to speculate that the large number of South Africans in the show is due to the fact that Njami curated the first ever Johannesburg Art Fair in 2008 and may have maintained connections with galleries from that time onwards. Unquestionably, these continue to be good times in terms of visibility for contemporary African artists in blockbuster exhibitions across Europe and it is about time because it has been a long time coming. The first show that is attributed to being seminal in promoting African visibility on the contemporary scene is Magiciens de la Terre (Magicians of the Earth) 1989 at Centre Pompidou in Paris France. It was organised by Frenchman Jean-Hubert Martin, although widely considered a success, ten years later the show was mutilated by Okwui Enwezor and Olu Oguibe two globe-trotting curators of Nigerian decent who have now literally written the book on contemporary African art shaping much of the dialogue as it is today. In Reading the Contemporary, the co-edited book that would arguably lead to their apotheosis – among other monumental accomplishments -- the two authors charged Magiciens de la Terre of pitting non G-7 artists in a “curious” position against their counterparts, and thus exoticizing Third World Artists. Well Third world artists will always be exoticised, that is the whole point of exhibitions like Magiciens de la Terre, Here Africa / Ici l’Afrique or The Divine Comedy. The most we can do is utilize this exoticism to our benefit as Africans after years of marginalization. Now it is about 15 years since the publishing of that book and the two authors along with Njami and others can also be held accountable for mishandling the opportunity given to them as they continue to recycle the same names in what have been the most important breakthrough contemporary art exhibitions of our times. Therefore, as much as there is cause for the celebration of African visibility, there is also a need to open up this seemingly exclusive club to new players, as has been indicated with the inclusion of an artist from Zambia bearing in mind that there are a lot more Chikwa’s, where he came from and this is something that organisers of exhibitions like The Divine Comedy should take into consideration. There are African artists out there who live the discourse, not theorize it, they live the struggle and without the supporting structures for cutting-edge contemporary art production can attest to the Possibility to Create in Hell. The theme and context assigned to the on-going exhibition by the Zambia National Visual Arts Council (VAC) at its Henry Tayali Gallery base evokes depression so spirit-crushing that it leaves one short of bludgeoning oneself “about the head with a steel pipe” in utter despair to borrow the words of Werner Herzog when cast in American cartoonist Aaron McGruder’s The Boondocks. The works on display are certainly impressive, featuring some of the country’s finest talents as well as a few delightful surprises, artists that have been off the radar for a while such as sculptor Smart Banda and the painters Mufiti Mushoke and Wilson Lungu -- formerly identified as the recording artist Wille, popular for his comical love songs in Lamba. The show’s anxiously beckoning title almost says it all “Visibility (can you see us?)”. It is a restless cry for attention, a holler to be seen. A testament that Zambian visual artists feel neglected, abandoned by patronage both public and private, a sad state of affairs indeed although this can only be subtly detected in the short exhibition write-up. “The theme for this show ‘visibility’ is prompted by the fact that visual arts are created to be consumed visually and how else can the artists make their works available than to collectively bring these in here and present them to you in this manner”, it reads in part. The cry out continues with four bullet points declaring “some say they don’t know where we are located, some feel we haven’t marketed ourselves, some think we don’t make enough noise, some imagine we are too hidden within the Lusaka Show grounds”. The statement welcomes first time visitors to the gallery and urges them to call again now that they have located the space. But sadly, the well-meant appeal nose-dives into a knee-blistering grovel. “Please feel free to come in at any time. When we don’t have any scheduled show, we will always have some kind of filler show. Bring family and friends to our gallery. Your continued patronage will motivate us to open our doors even wider to meet your artistic needs home or corporate. To our established patrons, thank you for your support over the years. Your purchases have not only helped the individual artists but kept the gallery and the Zambia National Visual Arts Council going”, ends the statement declaring how grateful the council was. Well, one can only sympathize with VAC. Running an art gallery even a quasi-governmental one like the Henry Tayali is not easy, more so in Zambia where both leadership and the electorate have wedged the arts firmly in the back seat if not the boot in the vehicle of national development. A laughable situation, considering the arts by providing informal employment have firmly been at the steering wheel of this vehicle under very difficult circumstances which have deteriorated as we approach the much glorified golden jubilee. But there was a time when the arts were valued in this country, a time when they were even included in the official independence celebration programme under the National Exhibition of Art and Culture in 1967 which had a printed exhibition catalogue that carried an eloquent foreword by late liberation hero Simon Mwansa Kapwepwe who was Minister of Home Affairs at the time. “Culture is the heritage of us all. Some may be more interested than others in the treasures from the past, but no one can fail to take pride in his country’s participation in the story of mankind as represented in carvings, sculpture, music, painting and the other arts”, declared Kapwepwe in the opening remarks of the text. “The men of culture are truly apostles of tolerance and understanding, the guardians of beauty and light, and our hope in this world for unity and concord,” wrote Kapwepwe of the artists in closing. That great son of the soil could not have put it better. It is true there is no Zambian that has helped promote the culture of his or her country globally than a musician, dancer, theatrical performer, fashion designer, chef, or painter. Other professions simply do not count. Any Zambian in a high end job abroad working for Microsoft, The World Bank, Google or NASA does not apply any indigenous touch to their work, this applies to athletes too – especially the footballers -- who sell nothing culturally except perhaps for the flag when they participate in international tournaments. Ironically that too is often in a wrong shade of green or copper. Nevertheless, despite once holding a place of importance, the arts continue to be considered a career path taken by the academically challenged or those supposedly afflicted with a limited intellectual capacity, they are no longer seen as the apostles Kapwepwe spoke of. They are ignored and as such it is probably justifiable that VAC should call upon the community if they feel neglected. VAC turns 20 next year but it is struggling now more than ever before. Most of its past funders, a pantheon of foreign embassies and none-profit organisations have shifted their focus towards different areas probably anticipating that the Zambian government through the National Arts Council will take up a more tactile role in supporting the arts. Regrettably this has not been the case. For two decades VAC has received oscillating levels of enthusiasm with regards public patronage depending on the government of the day. Recently, there has been a glimmer of hope concerning the streamlining of the arts as a sector with the tabling of a new arts bill whose journey to parliament has constantly been riddled with inter-ministerial conflicts by interested parties ending in a sluggish crescendo of inertia after the first minister under the “Tourism and Arts” designation was slapped with court cases -- that were not connected to the arts – before losing her job. The new minister has yet to say anything about the arts bill or the arts in general, continuity of course not known to be a strength in Zambian policy making, one might speculate the bill is officially dead. So much for VAC’s cry for visibility when even the highest authorities put the arts on the shelf. As for the general public, these are challenging times; one would suspect the populace is currently preoccupied on how to budget around higher utility tariffs; commodity and petrol prices while the corporate houses will be busy keeping their collective eyes on the fluctuating Kwacha, the purchase of art will be the last thing on their minds. Depressing indeed, someone pass the steel pipe. “Visibility (can you see us? )” runs until the end of July to pave way for “The Showtime Show” during the 88th Agricultural & Commercial Show whose theme this years is "2014, Breaking New Grounds". Showtime will be an opportunity for VAC to showcase the best Zambian works to an audience that never visits them regularly; it will surely be a good time for visibility and breaking new ground. The Zebra Crossings Cafe at Ababa House along Addis Ababa Drive is very familiar ground to the painter Caleb Chisha having exhibited there several times in group shows. But next week, on Thursday 12 June; for the first time he goes it alone in what will be his first official solo exhibition. Of course last year he did have an impromptu display of about 12 paintings – organised by a friend -- at a dance venue during an informal visit to Copenhagen, Denmark, but technically, this one counts as his first solo. Entitled Childhood, Chisha is expected to take his viewers on a nostalgic journey into the playful innocence of childhood, a Zambian childhood, in which almost everything is a toy, from used tyres to seemingly risky catapults. A childhood that the artist – who turns 28 in a few weeks’ time -- experienced growing up in his hometown of Ndola on the Copperbelt Province. “My work is inspired by children’s lifestyle in the period that I grew up. I think this has changed nowadays you can’t even play with catapults its computers, things have changed” he says. Known for the extreme photographic realism of his oil paintings, viewers should not expect too much of a shift but he does seem to be experimenting with a combination of vivid hues against monochromatic pictorial backdrops or vice versa to achieve a creative play into spatial illusion, accomplishing a three-dimensional effect in certain instances. But generally as for the mood of his usually warm colours viewers should expect a more subdued pallet. Furthermore, for the first time he will be showcasing some large format pencil drawings and one might add it is not easy to notice the difference in material and technique between the drawings and the paintings. Actually, Chisha’s painterly skills fortify him as a prodigy, something that continues to be recognised by his peers, collectors and critics, he is considered by many, one of the finest painters in Zambia – past or present. Certainly he has proven his technical skill since emerging on the scene a few years ago, but it is time he started seriously applying a deeper imagination to his work, rather than to just paint beautifully. It is this that can surely set him apart, this is not to say he is not trying. 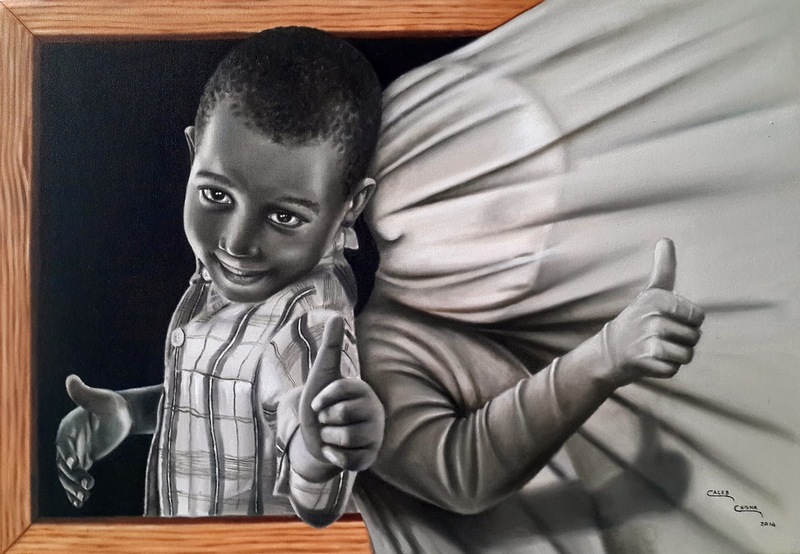 Perhaps this is the direction he is gradually taking with works such as All Good, a partially black and white painting of two boys raising their thumbs up. One shows his face with an elusive smile as he appears to emerge from the darkness of a picture frame while the other is a faceless child, wrapped almost like an Egyptian mummy in what is supposed to be the canvas of a painting. All of Chisha’s works are captivating in nature, but a closer look at All Good is rewarded with the revelation of adequately referenced metaphor. 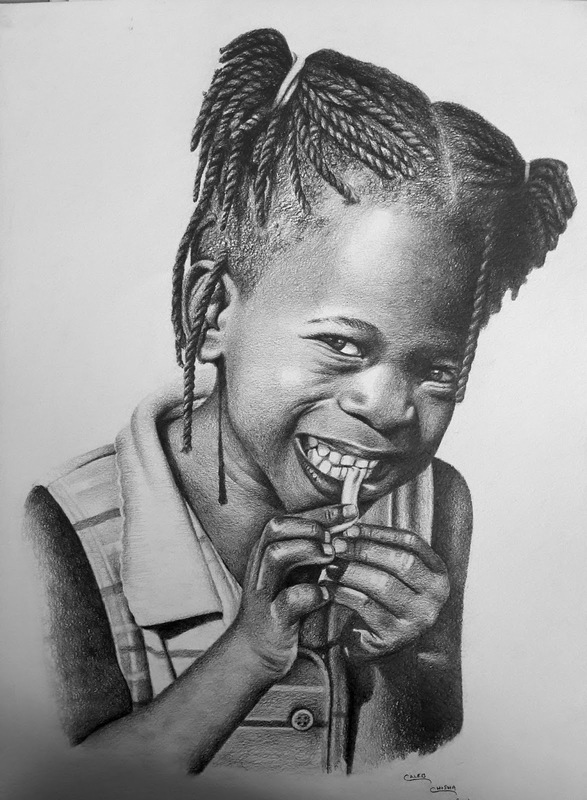 The child with an elusive smile evokes shyness or someone with something to hide as is often the case with children who may suffer neglect or abuse and may have nobody to tell. Similarly the faceless child can also reference neglect, abuse or indeed the faceless street child. The two children in this painting are juxtaposed like friends in a photograph, again creating the reference of an imaginary friend that children of a certain age may be known to find psychological refuge in. Nevertheless, as an artist he surely is maturing with constant practise. Apart from working on commissioned personal portraits for which he charges anything between K500 and K5, 000 depending on the material and size, he has also been busy facilitating drawing and painting workshops alongside Candice Rogoff of The Art Shop. 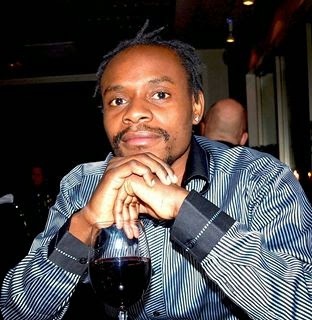 Since his Lusaka debut during the Black History Month at the Lusaka National Museum in 2010, he has consistently exhibited his work in several shows on the Lusaka art scene and last year won the people’s choice award during the Lusaka Centennial exhibition organised by Quentin Allen at Manda Hill Mall. He is also one of the artists from the Art Academy without Walls (AAWW) in the Lusaka Show grounds that worked with the German adventurer Andre Pilz on his Nala Project last year. Chisha’s studio space is at the AAWW where he can often be found surrounded by younger artists willing to learn from him as he also learns from them. Clearly he has an inborn inclination towards teaching, but he remains sketchy as to whether he would consider undergoing professional instruction towards enhancing his tutoring abilities particularly by attending a higher learning institution whether locally or abroad. Nevertheless, we can only congratulate him on his first exhibition which will run until the end of June.